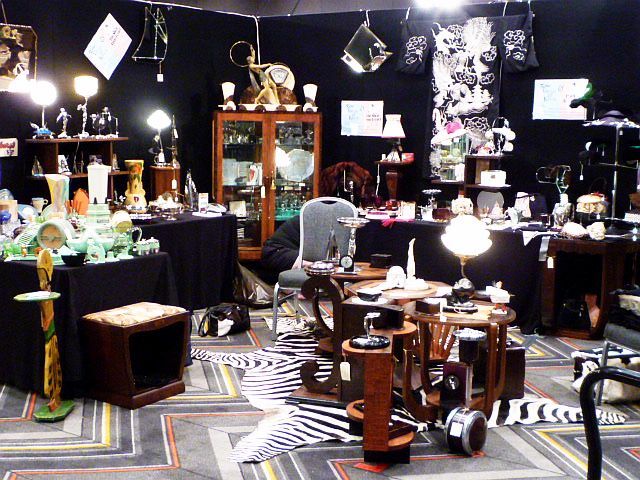 We're finally done with the antique fair, phew! We've packed, repacked, unpacked, re-sorted the shop...and even had a day off. We focussed on Art Deco this time, of course with a skin on the floor to set off the look. Our green display was decimated within the first hour! 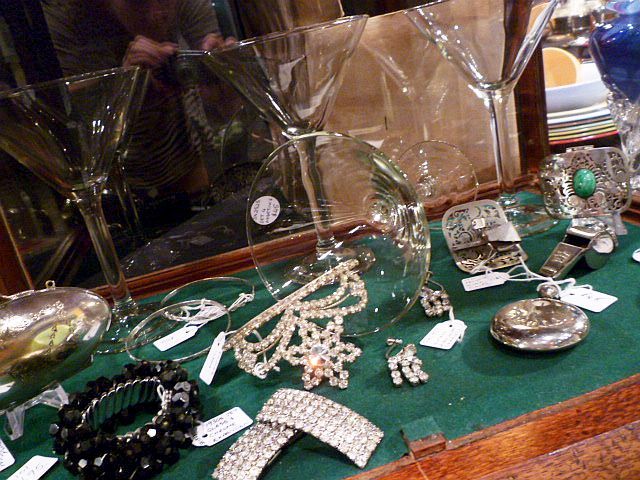 Martini glasses and sparkles, what better to set the mood for some serious shopping. Tons of little treasures to charm and inspire! 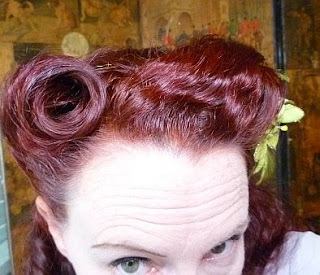 Self-cut 40s fringe works wonders for styling, yay!! And no, I didn't wear this outfit at the fair, this fab 40s crepe suit was purchased on our recent buying trip and will be in the shop soon. 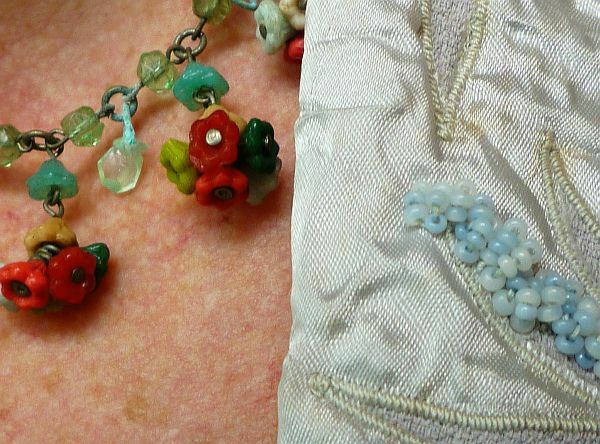 It has beautiful beading around the collar which is all intact, my 40s glass beads go so well with it I think. And just what did she wear at the fair, I hear you ask?? Sue put this pic up on our Facebook page earlier, click the link to see her hilarious comment about the lemon-sucking looks on our faces. I'm wearing the 40s crepe dress which is known as 'the poo', can you guess why?? Sue is wearing my blue suit, last seen here. 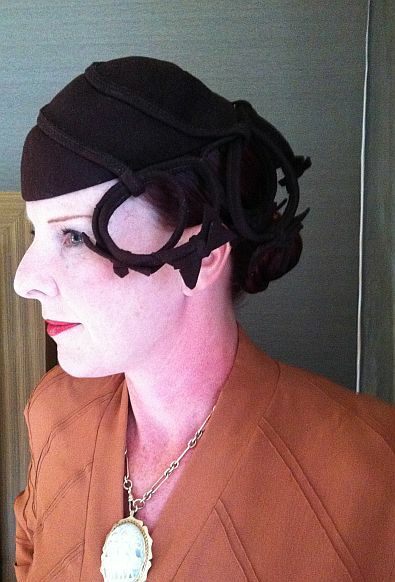 Here's a better pic of my new 40s hat, on its first outing. I'll be catching up with all your doings in the next few days but I've been having trouble commenting on some blogs today; the post a comment box hasn't been showing up...please let me know if you've had this happen and what you did about it! You both look amazing! It sounds like it was a successful fair. I'm having trouble commenting on blogs with the embedded comment boxs, since blogger introduced replying yesterday. You look stunning, in both the lilac suit and the "poo" dress! I love the Poo, it's very elegant as poos go! And that final photo of you in the amazing hat is.. well, amazing! Your stall look so beautiful, I would have loved to wander round ooh and ahh-ing with envy over all your delicious treasures. Well I know why it's called "The Poo" Because my Husband bought a car some years ago that was a nice shade of brown. *heheh* I nick-named it "POO LINE" And Hubs was quite mad about that. The car had a nice big strip of silver chrome and that is where I got line from. You & Sue look quite lovely. You prostis look so elegant! sucking lemons or not.I want all your hats and treasures. your 40's hat is quite intrigueing amor.adorar how you decorated your stall. You look like you stepped right out of a fashion magazine of the past. And your booth is stunning. Love your displays and that beautiful necklace!! 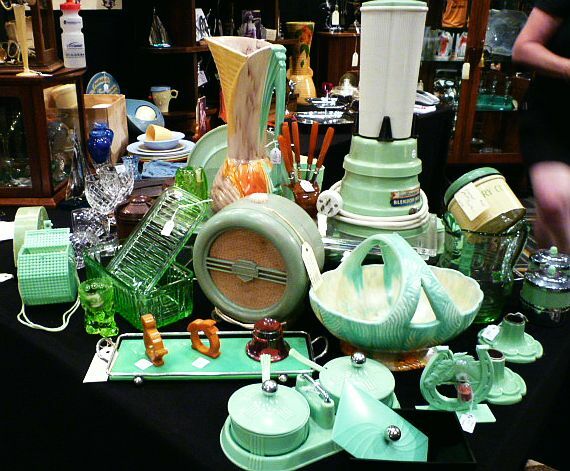 Oh my word, I would have loved to have got my sticky mitts on some of those treasures. 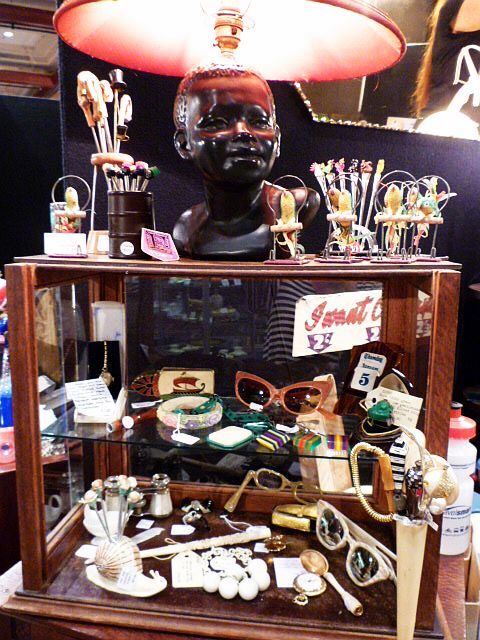 Amazing looking stall, and you look fabulous! You Ladies look like yoru right out of the Late 30's! Wow and what success at the fair!